Today is Beloved Niece's birthday. I may have mentioned her here from time to time because I've been buying books for her since 2010. I know the date because I kept a list. Wait. I know I've mentioned her here. This is the niece I read Skulduggery Pleasant with. It wasn't that long ago. I finished in January, 2015. I keep a list. Okay. Well, I learned last week that Beloved Niece is taking beacoup de science- and math-related AP classes next year. She may be taking some this year. Some of these things I had never heard of when I was her age. Seriously. I don't think they had calculus and physics in Vermont back then. She's also, I was told, interested in studying bioengineering. I have to up my game. I have to figure out what the game is. So for this birthday I got Becki the first Lockwood & Co by Jonathan Stroud, because these are our kind of books. I mean, just because you're all AP doesn't mean you can't have fun. But, then, because I am a truly superior aunt, I googled bioengineering and YA fiction. Yes, I know not many aunts would have thought of that. That's why I am a superior one. Thus, I learned about biopunk. According to What Is Biopunk?, a nice short piece at ScienceFiction.com, "...the essence of biopunk: subversives using futuristic biotech." I so love a short explanation. The article's author, Josh Evans, also says, "It is not logical to append the “punk” word to a genre name unless at least some of the characters are rebels working against what is considered the “norm” of society. Typically, a punk has some anarchist views and is less likely to obey society’s laws." I did not know that. See all I'm learning because my niece has gone STEM? 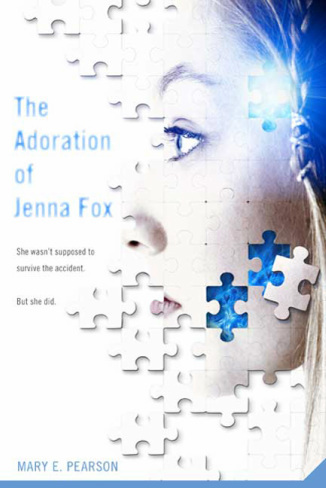 To try to support this new information I received about my young family member, I also got her The Adoration of Jenna Fox by Mary E. Pearson. I saw it mentioned in biopunk articles and, if my recollection of reading it is at all accurate, it certainly seems to fit the bill. Sidebar: According to that What Is Biopunk? article, Dark Angel and Aeon Flux are both examples of biopunk TV. Both shows I liked. Though, honestly, don't ask me what Aeon Flux is about. Even this doesn't make it clear to me. At any rate, this is a genre I'm going to need to pay a little attention to.